Except for once or twice, I’ve managed to get a shower about once a week, with sponge baths in between as needed. I manage to keep reasonably clean most of the time, but this life is not for those with a compulsive need to shower daily. I’ve only taken out the solar oven a few times, and frankly I keep debating whether it is worth the space it takes up (which is a lot) to carry it around. But I am optimistic that now that I am more settled with other things, I will expand into using that more. I recently started using my thermal cooker—basically an oversized thermos—for cooking pasta, quinoa, and couscous, which also had been merely taking up space for most of this year, so if that is precedent, there is yet hope. 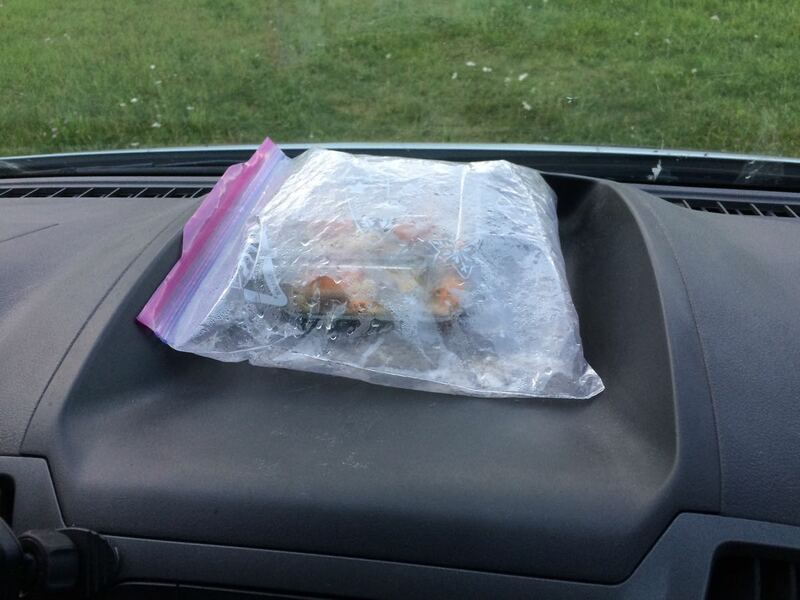 Mostly, my cooking consists of the DIY version of solar cooking: food in a bowl in a plastic bag on my dashboard. You know how cars get super hot in the sun? This uses the same principle. 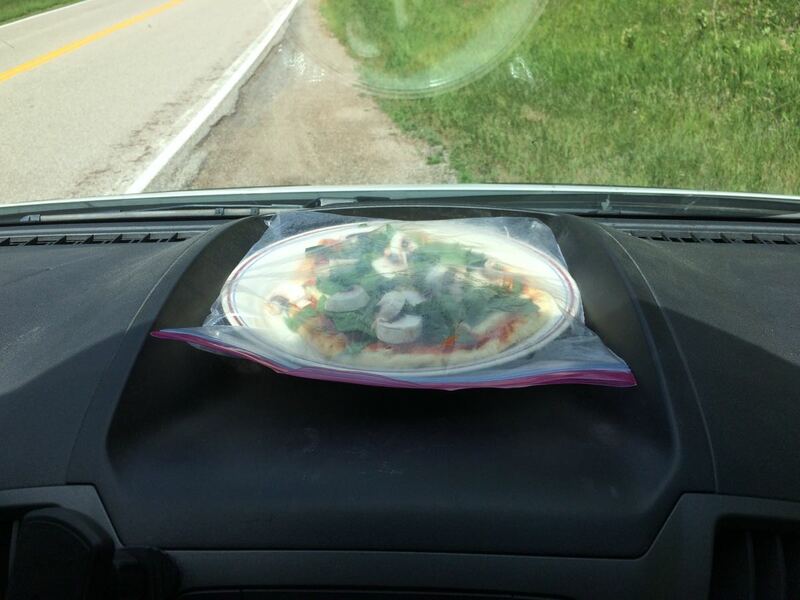 I can warm up cold or frozen foods on my dashboard while driving, with the plastic bag trapping the heat inside and that hot air cooking the food just like in a slow cooker or an oven on low. It won’t boil water, but it gets pretty toasty. Warming pizza: toppings on a slice of naan. Besides cooking, I eat a lot of raw foods, which can mean anything from a good salad to more elaborately prepared meals. I don’t often go in for elaborate, but have tried some very tasty recipes that I would not have thought of without a recipe book. I have 16 recipe books. Yep. Just counted. I’ve also been growing sprouts in a jar, though the summer is making it more difficult for me to keep them from overheating and I’ve lost a few crops. What I don’t do is buy prepared meals, whether at restaurants, fast food joints, or grocery store delis, because it is more expensive than making it myself, and I need to be super frugal. I do buy healthy food though, and mostly produce. Meal planning quickly became very important, as I don’t have the space to have much extra, so I have to buy only what I expect to use soon and at the same time not forget a critical ingredient in the grocery story. Plus, with my choice of solar cooking instead of propane, I need to always plan a meal or two ahead. That means thinking along the lines of: I’m going to be hungry in an hour, or three hours, what do I need to put on the dashboard now? Or do I need to soak some nuts or dried fruit? Or marinate some veggies? Or whatever. I do keep a box of cereal and a can of tuna around as emergency backups, but I’ve gotten so used to the planning cycle that it can take me a month to go through a single cereal box. Yes, tuna. I eat a primarily vegan diet, but am not super strict about it, especially if someone else is feeding me. Tuna is about the only meat I’ll buy and prepare for myself—and not often—though occasionally I will buy a little cheese. There are many good reasons to eat vegan and raw foods, and for a long time I felt like I needed to justify my choice, but, for me, the bottom line is that I just like it and it makes me feel good. What goes in must come out. My bathroom-in-a-bucket has been working very well, which basically consists of a gallon bottle reserved only for pee and an “STP device”—a woman shaped funnel. 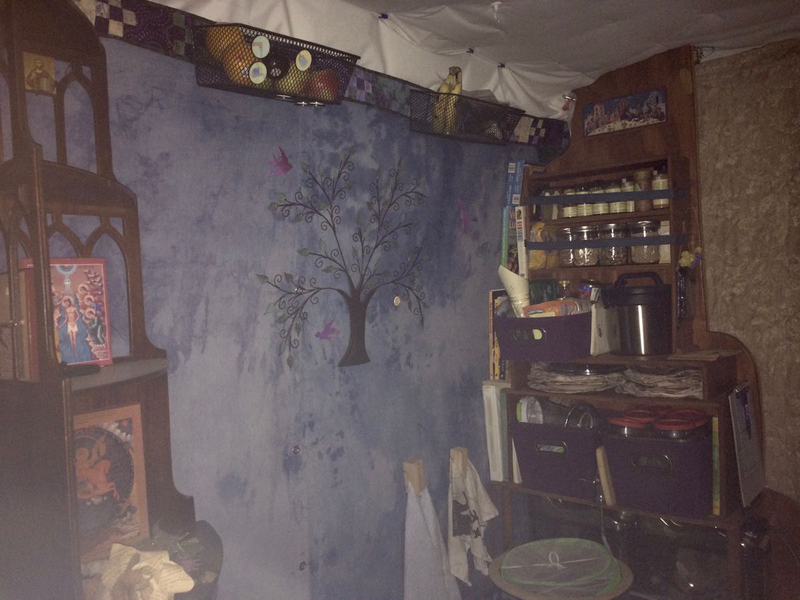 I keep those and a roll of TP and other toilet supplies out of sight in a tin bucket, the kind that popcorn comes in at Christmas, which I found in a thrift store for two bucks and has a nice picture of loons on it. It tucks neatly out of the way under my bed. I do need a new pee bottle though, and there is an unfortunate story that goes with that. A few days ago, I emptied my pee bottle into a porta potty, and because I didn’t want to set anything down in there, was juggling three things in my arms and the lid fell in. It was just floating there on top, and I did manage to find a stick and fish it out without touching anything (it could have clogged up their drainage system and I didn’t want the workers to have to get it out) but didn’t feel that it would be possible to wash it enough to want to ever touch it again. So, yeah, I need a new bottle. I have been toting around a spare, though much smaller, as a backup, with the idea that if I were camping long enough and filled up the one, I wouldn’t have to interrupt my solitude just to go empty a bucket. So I’m using that for now, but it really only holds enough for a day, maybe two if I don’t drink enough. Just in the last month or so, I’ve started to get the hang of finding free, dispersed camping options without too much fuss. Nothing has objectively changed, I guess I’ve just done it enough times that it doesn’t seem as big of a deal anymore. A couple of times recently I even stopped at a truck stop and used their free wi-fi to look up camping options for that night. I still make a point of showing up early enough to be able to find and survey it in the light, and decide if it is a place I want to stay. I also make sure I bring enough food and water for as long as I plan on camping, plus two or three days just in case. 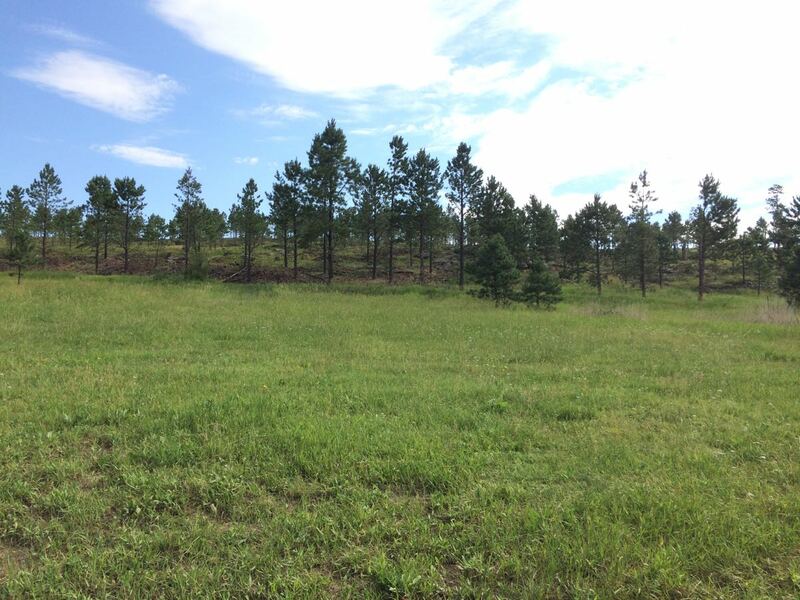 I’ve also found four small towns in this part of the country (one in KS, three in SD) that allow free, two or three night camping in a city park. Bless them. I’ve been expanding my backup overnight options from Walmart parking lots to also include Cracker Barrel and Cabela’s, both of which encourage RV overnight parking with dedicated spaces and occasionally water and dump stations. I can’t use those, but it means there is likely to be someone else there overnight. This has expanded my range of options. It took me a little while to get comfortable enough with sleeping in a parking lot to get a good night’s sleep, but now, for the most part, I’m fine with it. Most of the time, the Walmart, Cracker Barrel or Cabela’s lots are very safe, though I trust my spidey sense and on occasion have moved somewhere else for the night when I wasn’t comfortable. Sometimes there was a specific reason—one lot felt too exposed and alone in a bad way, another time there was what looked like a gang hanging out on the edge of the lot—but sometimes it just doesn’t “feel right.” Even if I can’t explain it, and probably everything is fine, it’s not worth the risk and I go elsewhere. I feel a bit like a modern hunter gatherer sometimes, as much of my attention is now focused on finding and getting the basic things I need for survival and safety—and hopefully a bit more. However, instead of hunting caribou, bison, or mammoth for food, I’m hunting down grocery stores and farmer’s markets, finding water from dispensers instead of streams (usually), and I bring my own shelter, I just need to find a safe place to park it for the night. The part that feels the same is that my mind is always thinking about what I need now, or will need soon, and where I can find it or how I can make do with what I have. Now that I don’t live in a single area where I know where everything is, I have to find a new grocery store or farmer’s market every few days, a new place to sleep every few nights, a new gas station to keep the van going, new wi-fi spots along the way for internet trip planning. Without a seemingly-unlimited, on-demand tap, I’m always on the lookout for places to fill up water. Without a plumbed bathroom, I have to find showers and places to empty my pee bottle. Without someone who comes around weekly to take away all my trash, I have to find trash receptacles myself. That one’s actually pretty easy, but it does require attention to my changing environment. I also came up with this set of chore magnets with pictograms (I drew them to look like the items I actually use) of the things I need to get or need to do over and over again. That way, instead of having to constantly run through a mental list of what I need now, I can use my magnets to keep track of the most common things. 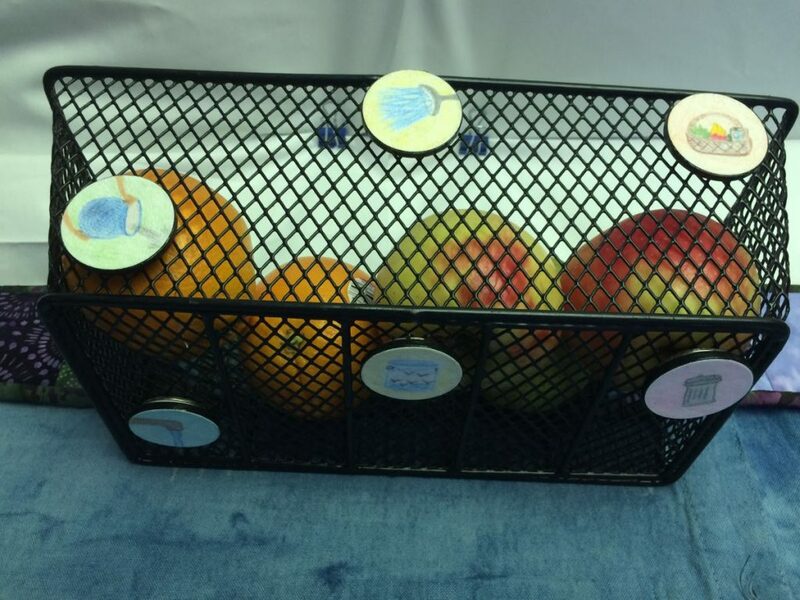 I stick them to one of my produce baskets, and when they are on the bottom, they don’t need to be done, and when on the front of the basket, they need to be done. They each have their own spot as another cue to tell at a glance which ones need doing. The chore magnets are, from top to bottom and left to right: Fill water tanks, empty sink water, take a shower, empty pee bucket, get groceries, empty trash. I’ve paired them to be thematically related. I have the time because, for the time being, at least, I am choosing not to work in order to focus on healing and personal growth. Although… if my dream job were to make me an offer, I would probably take it. Short of that, I am trying not to make any long-term commitments for now, though it has been sorely tempting at moments for both financial reasons and career advancement, and because I have a hard time not working, but I really need a break. Just for a while. 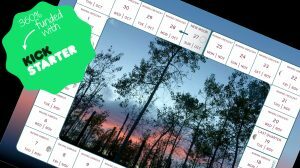 So, I am living exceedingly frugally in order to stretch out my limited savings as long as possible, and have managed to supplement that with a few day jobs here and there to help with that month’s gas and food—my two biggest expenses. Getting day jobs has been a bit of a mixed bag. Frankly, I haven’t put a lot of effort into it, but when I do…well, I’ve been turned down for painting a room, unloading a moving truck, fixing someone’s wobbly porch steps, all because I’m a girl. That’s not an assumption; they’ve flat out said it to my face. Although I am a very good room painter, have unloaded many moving trucks, built all the furniture in this van myself, and work as hard as most guys. But the jobs I get are for babysitting. Complete strangers will trust me with their kids on five minutes acquaintance but I can’t know my way around a drill and screws. Sigh. And scream. By the way, if you shop on Amazon.com anyway, you can help support me a little bit by first clicking through this link when you shop, and then I’ll get a small percentage back of almost anything you buy. I’ve only made $4.19 on it so far, but every little bit helps. Another recent development is that my social anxiety has begun to heal just a little bit, just enough that I’ve been able to talk to strangers a couple of times without freaking out and shutting down the conversation at the outset. I am beginning to feel comfortable enough in my own skin to be able to make connections with people who may enter my life, some for a day, some potentially for longer. I am also slowing down to see the things I care about, at whatever pace I am comfortable with, and not feeling pressured by get-there-itis, recommendations, or advertisements telling me what I should see or do somewhere. I do genuinely appreciate recommendations, which might let me know of something I am genuinely interested in and wouldn’t have known about otherwise, but I don’t feel bound to follow them, nor to do the standard tourist circuit. If I miss some “must see” attraction, I am okay with that. I did miss a Shakespeare festival last month because I got to town the week after it happened, and that was a bummer, but I couldn’t have gotten there in time even if I had known about it. The van has worked perfectly; nothing breaking down. My windshield does have a small crack that I’ll eventually have to get fixed, and am not looking forward to shelling out for that. Oh, does anyone know a home recipe for windshield wiper fluid that doesn’t leave streaks? I cringe buying it, knowing I’m just spraying that chemical grossness all across the country. But there are a lot of bugs to wipe off. Leave a comment below if you know of a good recipe. And probably the number one question just about everyone asks is, “what kind of mileage you get on that thing?” Since I left this spring for this season’s adventure, I’ve filled up 235.008 gallons of gas and used that to cover 4,055 miles. That works out to 17.255 mpg. Not good for a car, but much better than an RV. And way better mileage than my frame and stucco house gets. Here’s my biggest tip on saving gas, and therefore money, whether you’re driving a van around the country or a car around your home town. Treat the half way marker like the empty line, and never let the tank get below half. All motor vehicles get much better gas mileage on the top half of the tank. My battery unit is still annoying me, though less so. It finally got wired correctly (with the addition of a large, clunky adapter) to run my fridge on 12Vs, like I had intended, instead of 120Vs, so it is no longer eating through my battery on a daily basis. Yet now that I actually have electricity to spare sometimes (if it isn’t cloudy for days in a row), I’m encountering a new issue. The battery is programmed to save energy by turning itself off after 10 minutes of inactivity. Sounds like a good thing, right? But my energy saving Engel fridge cycles on and off in slightly more than 10 minute intervals (depending on the ambient temperature). See the problem? When my fridge goes into energy saving mode, the battery turns off, and doesn’t turn back on, so the fridge doesn’t, either. This necessitates that I leave something plugged in and drawing power at all times just to keep the battery from turning off and my frozen food from warming up. My phone doesn’t register enough of a power draw to do the trick, the computer draws too much power (anyone know of a 12V adapter for a 2013 MacBook? ), and the only other electrical item I have is the overhead fan. So even on chilly nights, I have to leave the fan on low all night long—with a cover to keep the draft down and the low hum killing the pure nature soundscape of remote camping—and even sometimes during the day if it is sunny and the battery reaches a full charge early. The overhead Maxxair fan/vent with the built in rain hood was one of my best purchases, and putting it right above my bed was the right spot. It helps cool me down on those hot summer nights so I can sleep. 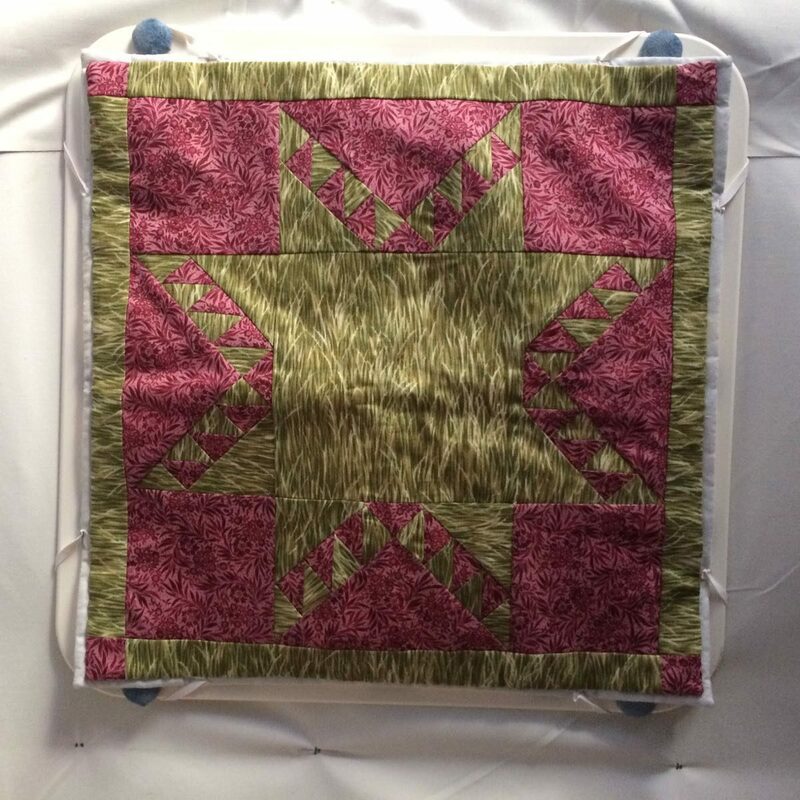 It reminds me of the prairie grasses with wildflowers. I LOVE IT! Thank you, Mom! The cover also blocks most of the light. Having a sort of skylight is often a good thing, but not at 5 am. Or all night long when parked under a street lamp in a parking lot. 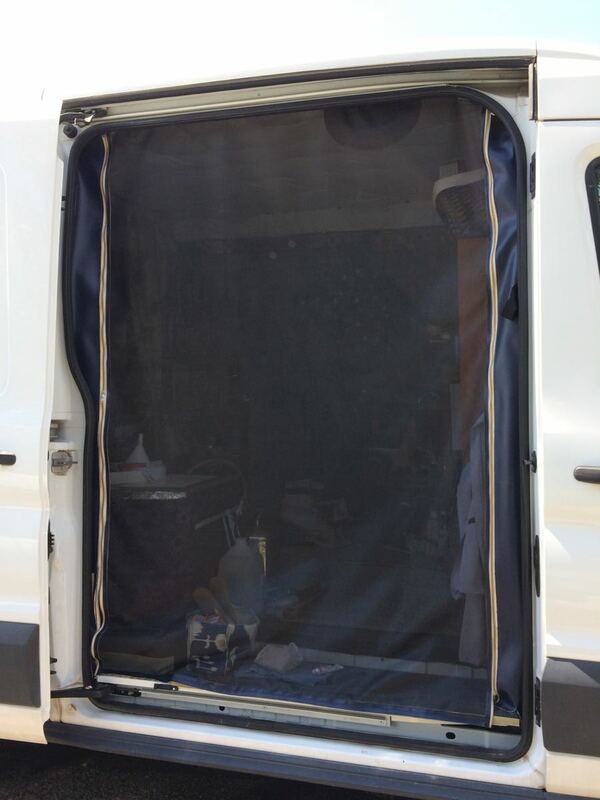 It zips up both sides and velcroes at the bottom, trimmed with marine vinyl that also attaches to the inside of the van. I left the interior curtains closed so you could see the netting better. It also zips from the bottom and the top on both sides, velcro on top and bottom, and this one has ties so that I can roll either the bottom half up to get at the storage underneath, or roll the top half down to have full use of the windows. The black “bar” thing in the lower middle is a velcroed opening so I can access the door latch from the inside (it’s in a weird place). Sewing the no-see-um netting to the marine vinyl, often with three layers stacked, was tricky, but I managed eventually. The edge pieces are velcroed to the van walls, with screws in strategic places to reinforce it. That way it can be taken down if I really want to, but not easily enough to get pulled out of place with frequent use. The netting lets me leave the side door open, or the side and back for additional cross-ventilation, which brings the heat down to a much more reasonable temperature without letting very many bugs in. Occasionally a couple will come in with me when I open a door, especially at night, but I’m quick at getting in and out. 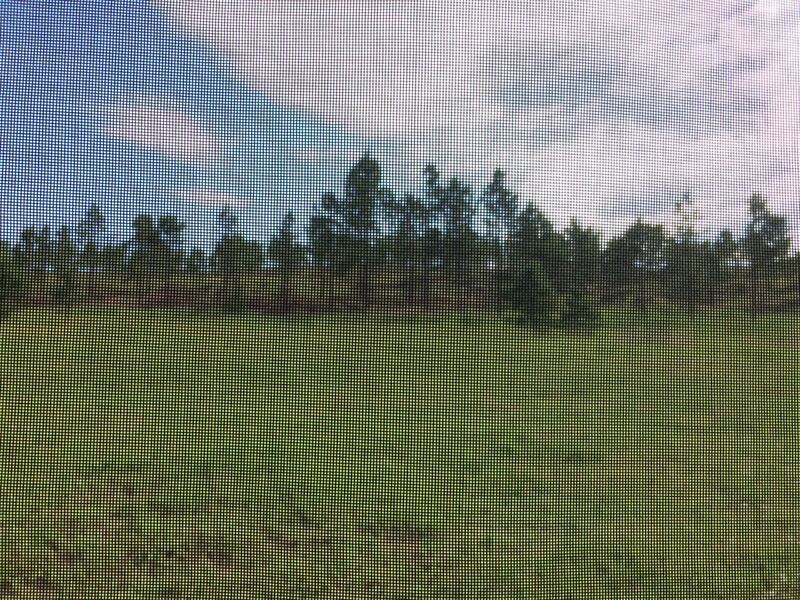 It does cut into my pristine view, since I have to see through a net, and I’m not happy about that, as sitting at the side door and looking out is one of my favorite pastimes, but it is worth the tradeoff of not either roasting or being eaten alive. Heating and cooling are on my mind everyday, nay, every hour. Not in a way that feels like a big deal, it’s just something that needs to be constantly planned for and adjusted to, and I’m not even talking about deep winter in the North or summer in the South. (I’m going in the opposite direction for good reason.) Living in the van isn’t the kind of environment where you can set a thermostat and keep a constant, pleasant temperature all day and night. If I expect it to be a warm day, then first thing in the morning, I’m pulling extra cool air in with the fan, and on a warm afternoon, I’m opening doors and windows and blowing it out with the fan. When I park, even for a few minutes, I pay attention to which direction the sun is so as to park with my most protected sides facing the sun, and still completely cover the cab windows with my reflectix shades to keep the sun from heating up the cab, and from there the rest of the van. I gave up on seeing out of the side and rear windows a month ago, and just leave them covered with reflectix and curtains most of the time. At least for the summer. If I expect it to be a cool day, then I’m trying to preserve what heat I have or can get, with windows uncovered, fan covered, and dressing warm. A cool night calls for an extra blanket, a knit cap (or two, layered), socks, and bed curtains closed to keep my body heat in. The windows are always covered every night for privacy, and that helps, too. 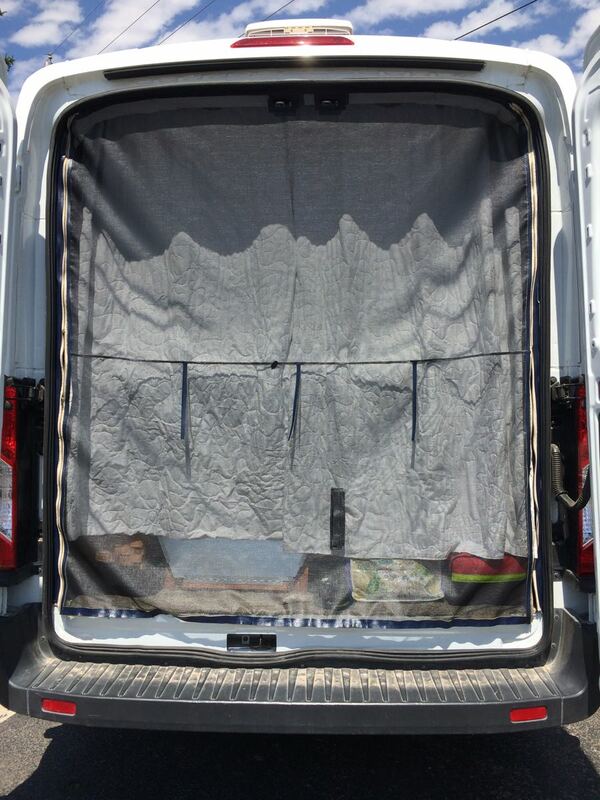 As long as I cover/uncover the windows at the right times to keep the sun in/out, and adjust the fan, I can keep the temperature in the van regulated quite well, and it is usually quite pleasant inside. The insulation works very well, keeping the worst of the temperature extremes out. But honestly, the most effective part of my temperature regulation system has been letting my body get used to temperature changes and acclimatizing to the weather. Regulating my temperature also means noticing where the sun is multiple times a day, and that means paying attention to which direction I’m parking, North, South, etc. And by noticing, I don’t mean “hey, there’s the sun, nifty” but “which direction is the sun, because it is actually relevant to my life right now and I need to anticipate where it’s going to be in a few hours or in the morning.” Being relevant in my life is another way that I’m learning to connect more with the natural world, something I felt drawn to but didn’t really need that much in a house in the city. I learn best what is relevant in my life. Now I’m out in nature more, but that doesn’t automatically make me an outdoorsman by any means. I am learning. Remembering the lessons from childhood, when I spent much more time in the woods, and learning in bits and pieces from books and people I encounter along the way. At the suggestion of a friend, I try to find “a sense of place” wherever I go, whether that is in nature or in a city, even if I’m there just for a night or two. I’m trying to learn what each new place is like on its own terms, getting to know the trees and wildlife, watching a stream or bird or squirrel at length to get to know its moods and habits, finding my way in a city or town without GPS as much as possible by recognizing buildings and things I’ve passed already, getting to know the layout of a museum or public park and thinking about the intention behind the design or architecture, etc. This has been revelatory. In a way that I can’t quite put into words yet. Stay tuned. This may seem trivial, but it is a much bigger deal than even I realized. From the beginning, I wanted to decorate my home nicely; I can’t stand the industrial look. But I underestimated how important that would be to my psychological wellbeing. I decorated mostly with things that were already in my house, things I have had for a long time and was attached to, and that now gives me the feeling that this really is home, not merely a place to sleep. That and having built it myself from start to finish. I like how it looks and feels in here, and have gotten a lot of compliments. An average evening in my van (last evening), settled in bed for the night I get this homey view. I haven’t been lifting weights by any means, or doing much strenuous activity at all, but I have been getting a fairly constant, low key workout just living in the van. I am frequently parked for the night at a slight angle, and even a few degrees off of level makes all my muscles work just a bit harder to keep my balance. And without any chair backs (or chairs) in my living area, my core muscles are slowly getting used to supporting my torso comfortably for longer and longer periods instead of needing to lean against something or having to slouch. And my manual blender gives my arms a small daily workout as I make breakfast smoothies or chop veggies or nuts, while my foot operated water pump does the same for my legs, and I switch left and right sides frequently to give them both a tiny workout. None of these are extraordinary feats, but all these little inconveniences make me work just a tiny bit harder on a consistent basis, and I am noticing the results in my muscle tone, strength, and control. Generally. I still have to buy a new pee bottle. I have two Luci Lux Portable Lights, which I absolutely love. I stick them in the sun in the morning and within a few hours they are fully charged and will give off six to seven hours each of more-than-bright-enough light, even on low. No batteries! Ever! The way I use them, that single charge usually lasts me for several days. They are great to have, and I usually use one for a few minutes most nights as I’m getting ready for bed, but since moving into the van, I’ve tried to move to a more natural sleep-wake cycle than I was used to at home, where I often stayed up very late. I’ve always been a confirmed night owl, so this happened far easier than expected, almost automatically in fact, just by not staying up with artificial lights at night and having a little light peek in around the curtains in the morning. I’ve been sleeping better, feeling more rested when I get up, and have more energy during the day. Well, that’s the practical side of my van living experience after one full year. If you’re interested in the one year report from a personal perspective, you can read that here. A year sounds like a long time, but honestly, it feels like I’m just getting started. Before you click away from this page, would you do me a quick favor? Would you leave a comment below and let me know what you want to hear more of as the blog goes forward? I’ve been noticing myself getting more philosophical lately, because that is largely what I am engaging with. 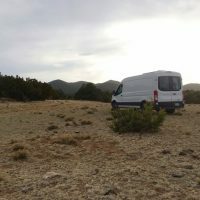 Is that getting too much, do you want more things-to-do-and-see-reports, the practical side of van living or traveling, local history, recipes, something else you’re curious about? Feedback is much appreciated. If you want to join me, you can sign up here to get an email when there are new posts, every couple of weeks. I read every word. Good information and an easy read. Great first year, congrats! Really enjoyed reading. Maybe expand on your locations, what you’ve seen. Looking forward to seeing more from you. We are starting our van adventure August 29th in a 1992 GMC Rally STX van. Nothing fancy as yours, two three drawer plastic units from a garage sale $10 for a dresser, 60″ counter top with propane underneath and Coleman campstove on top. 18 gal fresh water, 12v Edgestar fridge, full size bed across the back with storage and Dometic 972 toilet underneath. Thanks. You can look back at previous posts for where I’ve been. It doesn’t need to be fancy to get the job done, but I do recommend adding some homey touches. That doesn’t have to mean a full interior decoration, but something to make it feel like home to you, in whatever form that takes. Very interesting stuff! Awesome van too! Excellent writing and very enjoyable – really am inspired by your contentment and how you took your life in your own hands and immeasurably improved it! Loved reading your blog. Come and do the van life in Australia. It’s a great way to experience this very large country, and Workaway makes for a good way to meet new people. It’s all just so fascinating… Thanks for letting us have this window into what your life is like! Yay, I’ve been starting to take more great countryside pics, but was concerned they might be too boring. Stay tuned for more of that! I like both sides of the blog. It’s a peaceful read, actually. I appreciate the simplicity of your lifestyle and knowing the effects on your soul. I just recently signed up to get blog updates (thanks to Aunt Getta telling me about your travels) and very much enjoy hearing about your travels and reflections, mostly the reflections. My opinion—this is a blog for you, with us benefiting by traveling vicariously through your travels. As you seek further knowledge of your true self. Untethered by others’ influence (on what we think you should/not write about). Just you. Thanks for the open support, Terrie, and it is good to hear from you. Be well.